Portland City Councilor Jill Duson. PORTLAND, Maine — City Councilor Jill Duson is reopening her five-year-old bankruptcy case to try to stop a credit union from seizing her Portland home. Duson in March filed papers with a federal bankruptcy court seeking Chapter 7 protection from Trademark Federal Credit Union, which in 2012 got a court ruling allowing the county sheriff to take possession of her North Deering house to resolve nearly $19,000 in unpaid debt and damages. Duson is seeking to reopen the case because she apparently failed to list a second mortgage in her initial court filings. Because the mortgage was not included in the bundle of debts protected by her initial bankruptcy filing, it allows the credit union come after her property to try to recoup what it is owed. She declined to comment, citing the pending court hearing. Duson, who is seeking a sixth term on the city council this year and heads its housing committee, filed for bankruptcy in 2012. At the time, court documents show that she had under $200,000 in total assets — including her $190,000 home. Meanwhile, she had more than $280,000 in liabilities, including more than $44,000 in unsecured loans and debt on several credit cards. At the time, Duson had about $73 in the bank and a monthly income of about $3,100 from work as a lawyer for the Maine Human Rights Commission and part-time work at L.L. Bean, according to court filings. It is unclear what led to her financial troubles. Following the publication of this story, Trademark Federal Credit Union issued a statement saying that although it got a court ruling allowing the sheriff to seize Duson’s property, it has not moved to foreclose on her house. “Our goal has been and remains to work with Ms. Duson … to facilitate a fair and equitable plan of payment while enabling her to remain in her home,” said Joann Bisson, president and CEO of the credit union. Duson worked her way out of poverty to earn a law degree from the University of Pennsylvania, the Press Herald reported in 2011. She later ran the Maine Bureau of Rehabilitative Services, where she helped erase a multimillion-dollar deficit. Duson was elected to her current at-large council seat in November 2013. The city’s campaign finance filings do not require any disclosure of personal debt. After Duson submitted proof that she had attended a class on personal financial management, the court discharged her debts in October 2012, blocking creditors from coming after her for repayment or trying to seize her property. 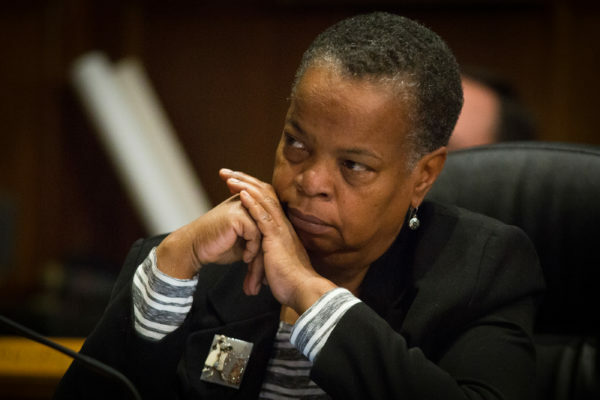 But the bankruptcy agreement did not include a second mortgage that the city councilor had taken out on her Pennell Avenue home through the U.S. Department of Housing and Urban Development. It is unclear why the $50,000 HUD mortgage was not included in Duson’s bankruptcy filing along with her $190,000 mortgage with Wells Fargo bank. Both were taken out before 2012, although all payments on the HUD mortgage are deferred and Duson may be eligible to have that debt reduced in the future, according a recent court filing. Duson’s lawyer, James Cloutier, declined to comment on why the second morgage wasn’t initially listed, beyond saying it’s a complicated, personal financial matter. The amounts now owed on the two mortgages are about $174,000 and $35,000 respectively, according to the court filing. Through a lawyer, Trademark Federal Credit Union has objected to Duson’s efforts to reopen her bankruptcy case. The matter is scheduled for a hearing. The credit union on Friday said that Duson’s efforts to reopen the case will lead to more legal expenses. “At some point it is natural for all of the other members to expect that an outstanding lien would be repaid,” said Bisson. In recent weeks, Duson has been at the center of a city council debate over bonding $64 millions to renovate four city elementary schools. She has advocated for initially taking on only half that debt and waiting to see if state funding comes through. This story has been updated to include comments from Trademark Federal Credit Union.